With the stunning cove and fishing village of Port Isaac just 10 miles away added with the golden sands at Trebarwith Strand and Polzeath Beach, April Cottage sits in the picturesque village sanctuary of St Breward. 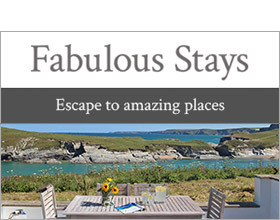 Boasting easy access to Padstow and Tintagel on the north Atlantic coast, this fabulous holiday retreat, just six miles from Bodmin, is beautifully presented and furnished with all the comforts of home. Ideal for families and couples seeking a spacious, welcoming base to explore Cornwall's hot-spot coastal resorts and charismatic coves, the cottage looks out to moorland countryside and distant sea glimpses. The village has a grocery store and The Old Inn provides fresh, local pub grub and traditional ales within paces. Excellent walks are guaranteed from the doorstep; discover historical Fernacre Stone Circle on Bodmin Moor or drive to King Arthur's legendary castle ruins at Tintagel, dramatically poised on the cliff top. Beach and surf lovers will delight in the stretch of superb sand and aqua waters at Trebarwith Strand reached across the rocks at low tide, with beach cafe and shop. The lively harbour resort of Padstow is a foodie paradise with celebrity chef restaurants, quirky boutique shops and galleries dotted along the pretty narrow streets cuddling around the colourful quay. From here, hire a cycle and enjoy the spectacular scenery of rugged moors, woodland valleys and picturesque villages on The Camel Trail, which links Wadebridge and the market town of Camelford, stopping for a picnic along the way. With a pretty private and enclosed garden - a safe haven for children and pets with sun-spot lawn and patio for alfresco nibbles or sun-downer drinks, April Cottage makes a truly blissful retreat. Four bedrooms: 2 x double, 2 x single. Family bathroom with bath, shower, basin and WC. Ground floor cloakroom with basin and WC. Kitchen with dining area. Utility room. Sitting room with oil fire. Snug. Note: Max sleep six adults. Note: Pets are restricted to the uncarpeted ground floor rooms only.